Kit is shown at 18 locations on E-bay for prices ranging from $7.08 up to $16.99. This kit came in a scotch-taped end-opening type box. I am no fan of this type of box, because invariably parts of the decal sheet find their way past one of the end flaps to become lost forever. Give me a tray and lid type box any day of the week. 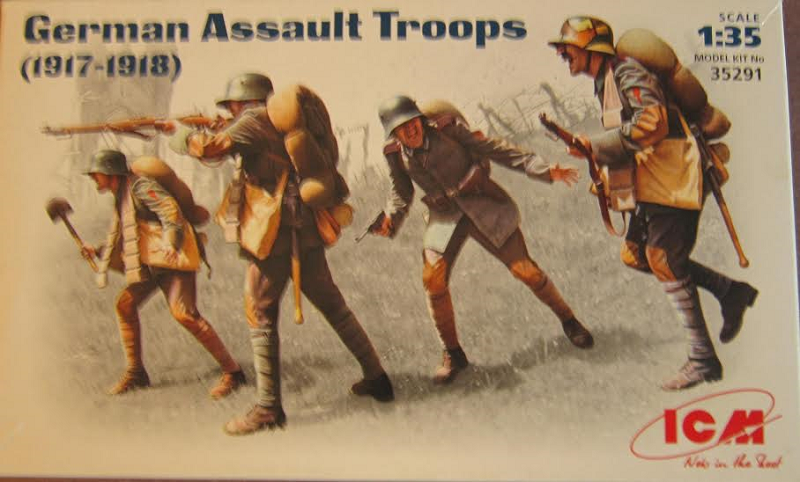 The box art shows 4 German infantrymen advancing past a ruined church and barbed-wire. All of them wear steel helmets and all have rolled tarps on their backs. Three of them carry canvas sacks. The first man on the left is holding a shovel in his right hand. He has a ammo bandolier around his neck and a rifle slung over his chest. Their uniforms are multiple shades of green. All their pants are bloused into putties. The next man to the right is firing his rifle. The third man to the right may be an officer. 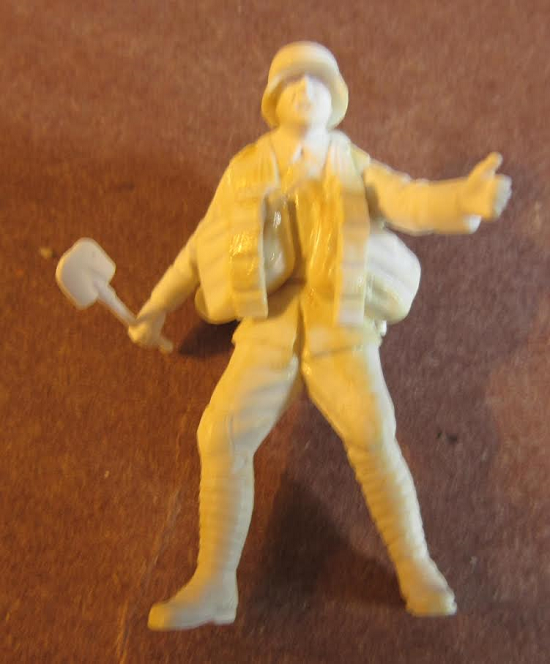 He has a pistol in his right hand and a holster for it on his belt with ammo pouches. 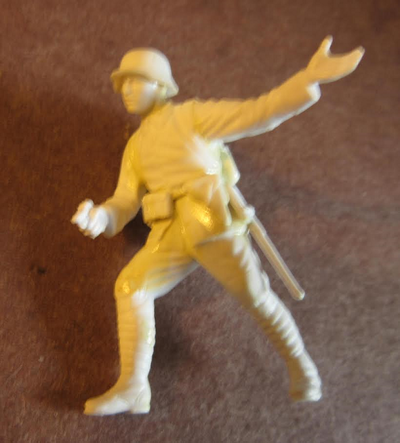 The fourth, and last man, is running with his rifle in both hands. His helmet is painted with medium-green, chromate, black and orange spots. The bottom of the box is the painting instructions in full color with a suggested listing of Model Master brand of paints. ​The figures are all molded in light-gray. I have assembled them all already. One side-panel has 4 color box arts of other kits that ICM manufactures: kit no. 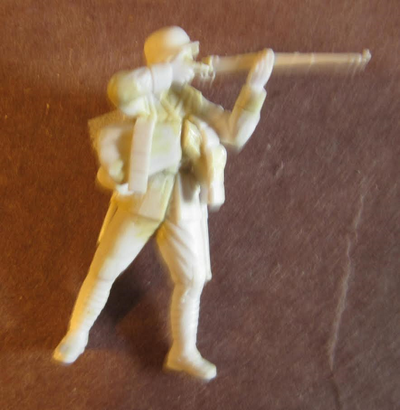 35061, French-Prussian War, 1870-1871, French Line Infantry, kit no. 35181, Soviet Tank Crew, 1939-1942, kit no. 35311, Soviet-Afghan War, 1979-1988, Soviet Motorized Infantry and kit no. 35201, U.S. Elite Forces in Iraq. ​Other side-panel says kit contains an unassembled plastic model kit. 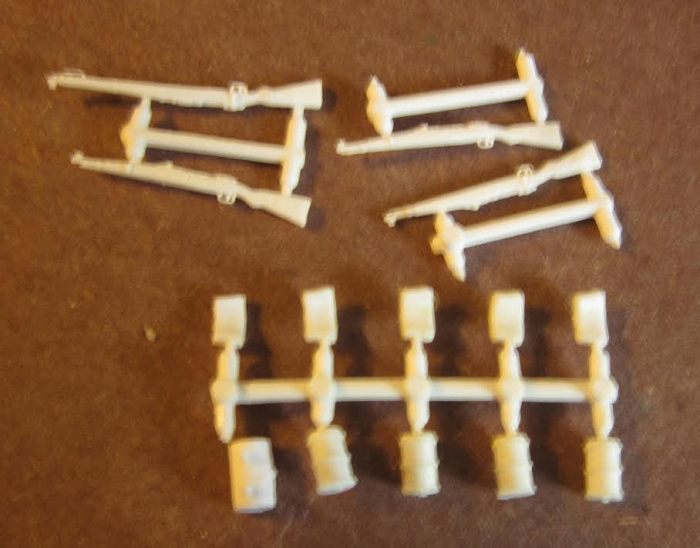 Kit contains 85 parts for assembly of 4 figures. Cement and paint are not included. Kit was made in the Ukraine by ICM and their P.0. box address in Kyiv, telephone and FAX numbers, e-mail and web addresses. ​A small sheet that is 5 1/4" x 7 3/4" format, printed on both sides says the kit is suitable for modelers over 10 but not for children under 3. IMPORTANT INFORMATION about the kit is in 20 languages, including English and Ukrainian. Kit may contain small and sharp parts and cautions about using paint and glue near an open flame and to use a well ventilated room. Kit is distributed by Italeri in Italy with their street and web address provided. The instructions consists of a single-sheet that also is printed on both sides in 8" x 11" format and is folded twice to fit inside the box. The face side begins with parts trees illustrations. Two trees are shown. 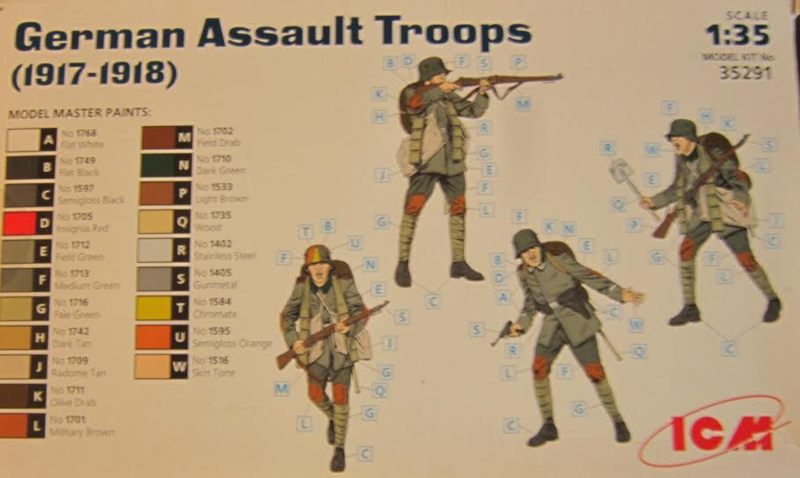 Light-gray letter B tree holds: ammo pouches, 2 types of rifles, helmets, mess kits, bayonets in scabbards, pistol holster and canteens (34 parts). ​ICM's address in Kyiv, Ukraine, their P.O. box and e-mail address and telephone number are provided. 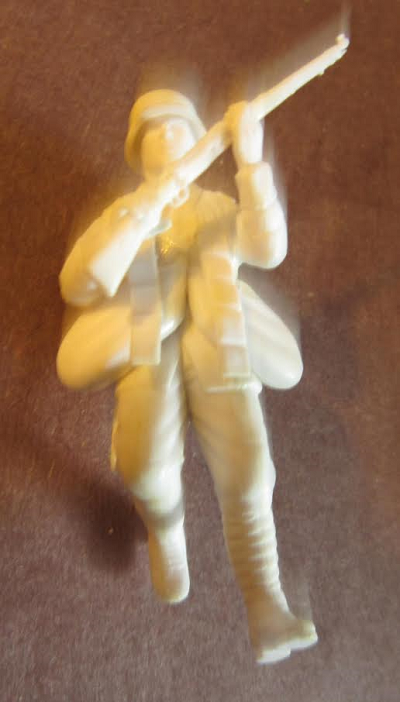 The detail and molding is very good as you can see from the assembled figures.